Ready to back it, boys? You may or may not be planning a trip to Germany, but if you are, and you row, you may find this helpful. They do things differently here, little things every step of the way. The rowing itself is pretty much the same – I’d have to say their stroke is the easiest thing to match here. It’s just the negotiating around the boathouse, getting the boat to and off the dock, and the little things they do in between rowing, that’s slightly different from what we do back home. They push the boat off the dock while standing, then pull their foot in over the water as they’re drifting away from the dock. They sometimes sit at the catch, not the finish, when they’re ready to row. Their oars are flat, and then they do a flip catch and pull through at “Und Los.” Depends on your coxswain how they start. They use their full slide when they are spinning the boat. (Starboards back, ports row…) Every one of these first three things seem to make the boat more unstable. They don’t seem to have any coaches. They never make comments about the row, how it’s going, or what we should think about before, during or after the row. There are no compliments, no complaints, no thank-you’s to the bow (although I still thank them for bowing, and thank them for the row, and they look at me like I’m odd), and there are no particular workouts. It’s just row far, rest, row back. It’s seventeen kilometers on the weekends and thirteen kilometers on weekday evenings. Even their short rows are longer than our typical longest back home, but it’s all steady state. They rarely do pieces unless training for a regatta. I have yet to see a stroke coach. They have a lot of wooden “gig” boats that are for novices, casual rowers, and “wanderrudern” (sightseeing rows that may involve overnight camping). But sometimes they race them too. They have boats for odd numbers of rowers, such as a 3x, 5x, 6x and 8x. Also the occasional single plus coxswain, also known as the wedding single. They launch stern-first at the dock, and then they have to BACK their boats all the way through the docked sailboats that line the sides of their launching area. It’s a long way to back it, and my forearms get totally sore by the time we reach the open lake. They carry a double like a quad, from the ends of the riggers, rather than toward the ends of the boat. It seems so much more awkward to me, but then again it takes advantage of their racks that roll out, so you don’t have to reach so far over the other boats to get them. They hose off the outsides of their boats after every row. But then they don’t dry them thoroughly with towels, so the lake grime is still there. They don’t flip their boats and wipe out the slides, so the insides of their white boats are a bit grubby. I don’t think they have a commodore who announces Work Days when everyone shows up and cleans all the boats out. We’d have these boats gleaming. Locker room windows without curtains. No separate shower stalls or curtains. Separate bathrooms for “Die Madchen” and “Die Damen” (as well as for boys and men) – but no showers in the girls’ bathroom, so they shower in the open area with the women anyway. The standing around before figuring out boatings. The grumbling about who got the better boat. The computer that worked one day to sign out boats, and then hasn’t worked since, and it’s back to a paper log. The interest in coffee after morning rows. The interest in beer after evening rows. The love of being outside and on the water. “Ah, die Sonne!” sighed my bow yesterday, when the sun finally came out around the last bend, the first time we’d seen it all day. The appreciation of a good row. They may not say anything, but they get that contented glow on their faces after a good row, and you know you were part of making that happen, and you feel more relaxed than you were beforehand, a bit tired yet energized, and you go home happy. 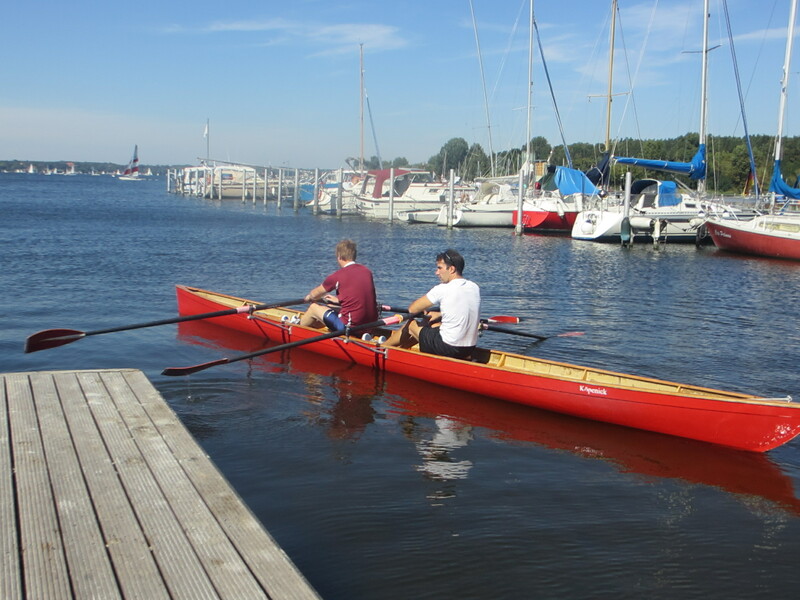 This entry was posted in Rowing and tagged Berlin, Germans, Rowing, terminology, Wannsee on September 11, 2013 by Jill M..
We miss you, Jill! My quad members had that glow on their face this am and one member even said it was the best boat she’d been in — I felt so awesome that I was part of her “best boat;” also, her comment made up for the fact that the coach mentioned my name a bit too often….and not in a good way. Still, I can feel myself getting better, which is a good thing. Awesome, Eileen! It’s so great when one of your boatmates says something great about the row. Hopefully whatever you heard from the coach was helpful! All the best to you. Thanks, Heidi — I will certainly let you know if I make it to Austria. I’d definitely take you up on your offer! Maarja, so glad you found this helpful! I enjoyed writing it down, and I’m glad it came in handy for you. Happy rowing and have fun in Berlin!